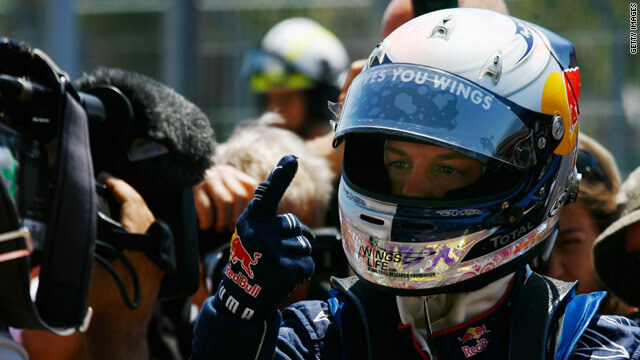 Germany's Sebastian Vettel celebrates his pole position for Sunday's European Grand Prix in Valencia. (CNN) -- Sebastian Vettel claimed his fourth pole position of the season ahead of Sunday's European Grand Prix in Valencia, Spain. The 22-year-old Red Bull driver set a time of one minute 37.587 seconds, 0.075 seconds ahead of his Red Bull team-mate, Australian Mark Webber. The pair have now record eight pole positions in nine races. "This circuit shouldn't be our strongest but it's good to put the car on pole," Vettel told the BBC. "It was very tough because we reintroduced our 'F-duct' (aerodynamic device) for this weekend and the mechanics had only an hour or two of sleep, so it's good to say thank you and put the cars one and two," he said. 2008 world champion, Lewis Hamilton will start third on the grid, ahead of Ferrari's Fernando Alonso who starts fourth, with Felipe Massa starting fifth. Poland's Robert Kubica will start in sixth place for Renault, one ahead of McLaren's Jenson Button. The Pole's team-mate, Russian Vitaly Petrov will start Sunday's race in tenth spot. Kubica ended the first qualifying session fastest, but Vettel took the lead in the second 20-minute session before going even faster in the third. It was another disappointing afternoon for Michael Schumacher who was again out-paced by his Mercedes team-mate Nico Rosberg. The seven-time world champion failed to make the top ten for the second time this season and will start Sunday's race down in 15th place -- his worst showing since he returned to the sport. Immediately ahead of Schumacher on the grid sit the two Force India cars of Adrian Sutil and Vitantonio Liuzzi. Rosberg will start in 12th place. Both Williams cars made it through final qualifying for the first time this season. Nico Hulkenberg and Rubens Barrichello set identical times (1 minute 38.428 seconds) in the third and final qualifying session, but Hulkenberg will start eighth, while his Brazilian team-mate starts in ninth place.